VATICAN CITY (CNS) — Because his cassock doesn’t have a breast pocket, Pope Francis said he wears a cloth pouch under his white robes to carry the crucifix he took from a deceased priest. Meeting March 6 with pastors of Rome parishes, Pope Francis said that while he was vicar general of the Archdiocese of Buenos Aires he went to pay his last respects to a Blessed Sacrament priest, an extremely popular confessor, who had died in his 90s. He put the crucifix in his breast pocket and carried it there until his election as pope March 13, 2013. “But a pope’s shirts don’t have pockets,” so now he carries it in a cloth pouch under his cassock. “And when I start having a bad thought about someone, I always put my hand here,” he said, showing the priests where the crucifix is. The pope’s annual Lenten meeting with Rome pastors focused on the priest’s call to be a minister of mercy. While he followed a prepared text, he added comments and anecdotes from his own life and ministry. “There are many wounded people, people wounded by material problems, by scandals, including scandals within the church,” he said. 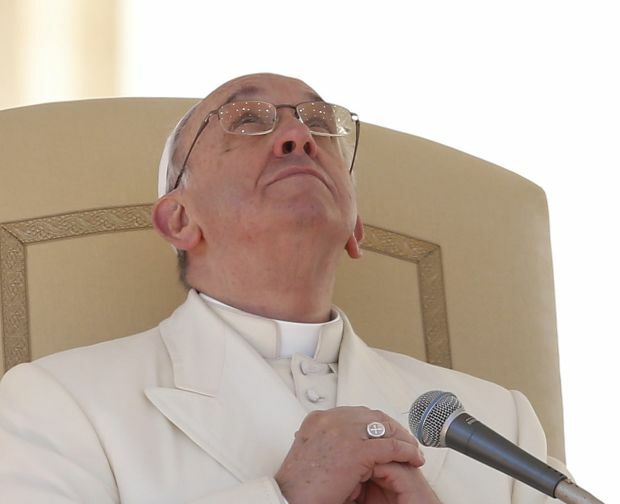 Pope Francis urged the pastors to devote time to hearing confessions and to avoid being either very lax or very strict. “It’s normal that different confessors have different styles, but these differences cannot be ones of substance, that is, involving healthy moral doctrine and mercy,” he said. The sick, the aged and children, he said, help priests learn to be merciful. “Do you know how to touch them? Or are you embarrassed,” the pope asked. “At the end of time, those who will be allowed to contemplate the glorified flesh of Christ are only those who were not embarrassed to touch the flesh of their injured and excluded brothers and sisters,” he said. “That’s a beautiful prayer,” the pope said. The pope also asked the priests if they prayed for their people in front of the tabernacle and pleaded with God to spare their parishioners just like Moses and Abraham argued with God to spare their people. Using the Italian word “pantaloni” — trousers — Pope Francis said the two Old Testament patriarchs “had guts,” and today’s priests must as well. NEXT: The pope said what about civil unions?